If you browse the available nature books and different sites in the internet that showcase forest wildlife, it is almost always that everyone of us gets to be amazed by the beauty of a deer. Deers are some of the nature’s gift to humans. During the prehistoric times, mankind hunt deer for clothing, food, and materials for early forms of tools. Aside from being a resource for human survival, deer has also a majestic physique especially with its antlers. The antlers are like nature’s crown for the most beautiful animal species in the forest. Because of this, deer are dearly loved by artists. 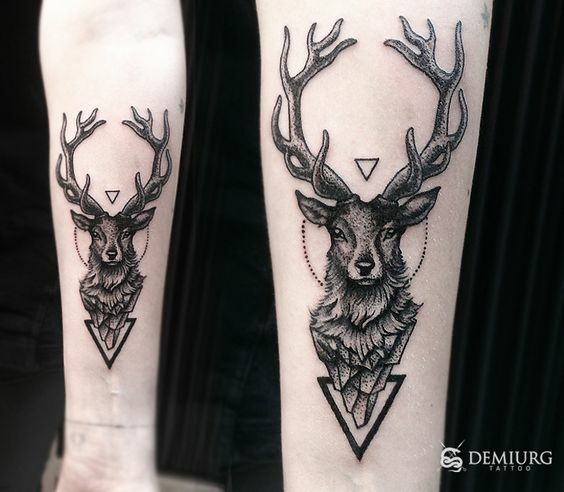 Tattoo masters offer deer tats to 1st time tattoo enthusiasts because not only it is a good design which they won’t regret, it also creates a serene feeling to the owner and to the awed public. The symmetry of deer’s face is best for geometric and linework designs. Some tattoo artists also rendered deer over beautiful watercolor backgrounds. Deer’s physical appearance is very distinguishable that a silhouette and cute versions of it can still be recognized and appreciated. Today’s post showcases 30 of the best deer tattoos shared in the internet. There are still a lot of awesome deer designs out there which we can no longer accommodate for today’s collection however, we are pretty sure the collection below is enough for it to convince you its magic.